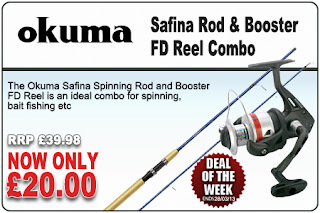 Deal of the Week is the fantastic Okuma Safina Spinning Rod and Booster FD Spinning Reel - RRP £39.98, now only £20.00! The Okuma Safina Spinning Rod has a very light action, cork handle, comes in a 2 piece Glass Fibre construction and is fantastic value for money. However as a special offer, you can get the superb Okuma Booster FD BTF Reel and Safina Rod for only £20 quid!! Ideal for spinning, bait fishing or as a general purpose rod. Don't miss this offer and get yours today while stocks last!